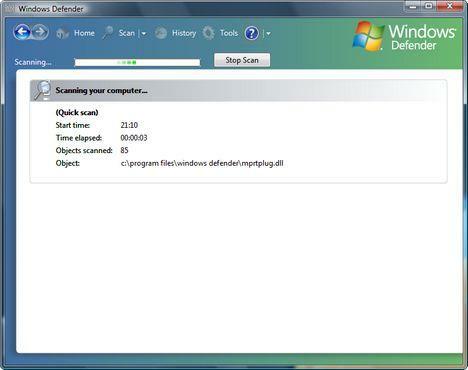 Windows Defender is an application designed to detect and remove known spyware from your computer. It is based on a solution initially developed by GIANT Company Software, a company which was acquired by Microsoft in December 2004. Before Windows Vista's launch, Microsoft has changed both the application and its name several times. Now it is included by default in all versions of Windows Vista in order to enhance the security of the operating system. Even though Windows Defender has been criticized for its shortcomings in detecting and blocking spyware applications, many users might choose to use it for several reasons: it is free, easy to use, light on system resources and it offers a basic set of protection features. For those of you who would like to give Windows Defender a try, we created this quick overview of the application interface and its main functions. Also, in the upcoming weeks we will publish a few articles about some of Windows Defender's most useful features. As you will see in the following screenshots, the interface is very easy to understand and use. You have the Back and Forward buttons which you can use to navigate through the different application screens. Then you have five main buttons: Home, Scan, History, Tools and Help. The Home button loads the Windows Defender status screen where you can see details such as the date of the last system scan, the definition version and different status application messages. 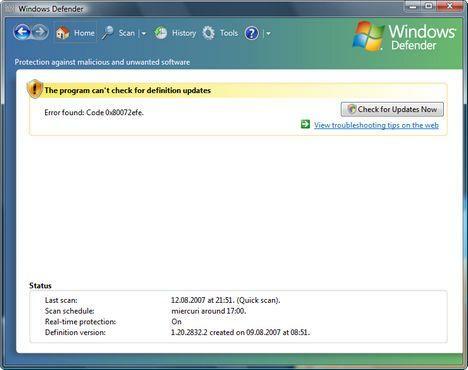 For example, in the screenshot below you can see a warning saying that the program can't check for definition updates and the appropriate error code which you can use to find troubleshooting tips on the internet. If you press on the Scan button, Windows Defender will perform a quick scan to detect the spyware that might be present on your system. If you want Windows Defender to perform a full scan, you should click on the small arrow near the Scan button. Clicking the arrow gives you access to the following options: quick scan, full scan and custom scan. 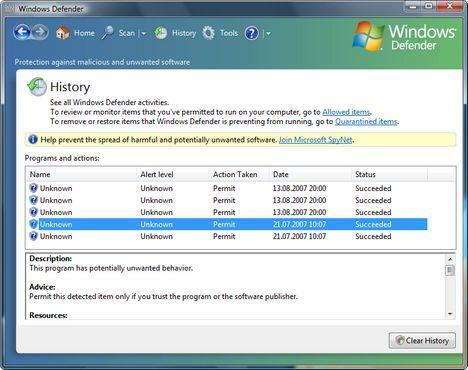 The History button loads a screen where you can see a list with all previous Windows Defender activities. Here you can review the items that were permitted to run or prevented from running on your computer. When you click on the Tools button, it will load the Tools and Settings screen. 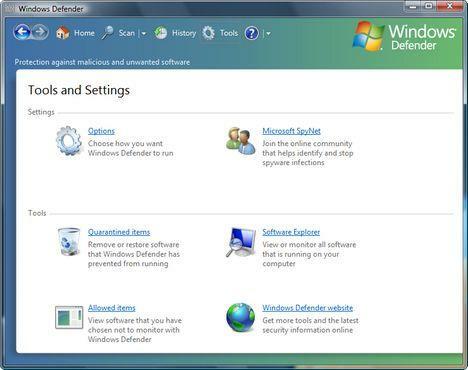 In the Settings section you can click on Options and then configure the way you want Windows Defender to run. Also you can join the Microsoft SpyNet community and help identify spyware infections. From the Tools section you can access all the Quarantined items, view the Allowed items list, monitor the software running on your computer and access the Windows Defender website. The Help button loads the Windows Defender help files. If you click on the small arrow near this button, you can also check for Windows Defender updates, view information about the application or the privacy statement.